When a coat turns into a goat and a bus to a bush…. Problems with reading or spelling are mostly characterised as reading and writing disabilities/ dyslexia. These diagnoses often leave the question of the causes open. 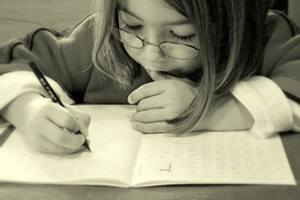 There are a lot of possible reasons for the development of dyslexia. Very often an auditory processing and perception disorder plays an important role thereby. When a person does not hear speech in an optimal way, this can also lead to problems with reading and writing. The speech centre in the brain is in the same way responsible for auditory, read, written, and spoken speech. Disorders of perception and processing of what we hear can e.g. lead to the effect that similar sounding speech sounds cannot be differentiated. The “bus” turns into a “bush”, a “coat” into a “goat”. For a child who already cannot differentiate such speech sounds in the hearing, the learning of right spelling is of course very difficult. The BENAUDIRA auditory training helps to regulate the central auditory processing and works out the speech sounds that constitute a problem for the affected person. For that purpose, instrumental music as well as sung songs and spoken texts are individually adapted to the hearing performance of the individual and produced as a training-CD. More information about the method: hier. If different pitches (frequencies) are not perceived in a balanced way, this can lead to the effect that similar sounding speech sounds sound the same. Many children hear deep sounds more sensitively than high sounds. For the situation in school this means that they perceive disturbing ambient noises very loudly in relation to the voice of the teacher. Thus it is more difficult for them to understand the spoken word in the right way. In addition, there is also an excessive demand caused by the effort from listening, which often results in a shortened duration of concentration. Under certain circumstances no dominant ear is pronounced or both ears switch in laterality from one side to the other. That what is heard can be perceived with delay or get mixed-up in order. An imbalance in a so important sense as hearing also affects the processing of other sensations. The whole system of perception, processing, and using sensations gets out of balance. In this way, also the optical sensations in reading and writing are affected.